I knit the Snow Crystal ball (red and white) on Monday, the Selbus ball (green and white) on Tuesday, and the Tricolor ball (no explanation needed) on Wednesday. Then last night I stuffed them--they taking a lot more stuffing than I was expecting, and now that I look at it, the Snow Crystal ball could use some more--and crocheted and sewed on the hanging loops. 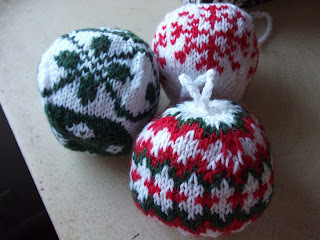 Each ball only took 3 hours to knit, even accounting for feline interruptions. This is how I'm displaying them, alongside my (faux) Russian nesting dolls. Aren't they adorable? I'm beside myself with glee at how well they turned out and how great they look on display. I will definitely knit some more as hostess gifts (and probably a few more for myself). All other projects are hereby being shunted aside for the rest of December! Wow, they are awesome!! I love how you've displayed them too. Thanks, Monica! I'm itching to sit down and do some more. i "typed" too soon. they turned out so great. i may have to get the book and start a new tradition for next year's holiday. You should definitely get the book, Lynette. It's so sweet. 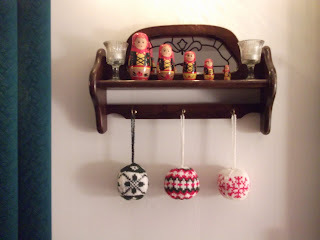 In addition to pictures of the balls, they have pictures of their other toys and decorations around their house, as well as translations of Norwegian poems about Christmas and winter. It's just a fun book to look at.